Last summer, a retiring staff member dropped by NAIT’s executive offices. It was a casual visit, without appointment, and he didn’t leave his name. Instead, he left a box of things he’d collected over a career that spanned decades. Inside was a surprise: an original program from NAIT’s official opening on May 27, 1963. “When I started to go through the materials, I thought, ‘Wow, this is of real significance,’” says Dr. Glenn Feltham, president and CEO. At first glance, the pamphlet (9MB pdf) may not seem like much. It’s smaller than a record sleeve and its yellowing pages are so thin that the printing shows through. But it was the document that went into the hands of guests including Edmonton mayor Elmer Roper, federal Labour minister Allan MacEachen and Premier Ernest Manning. For many, it was the introduction to NAIT’s story. For many, it was the introduction to NAIT’s story – a story that has progressed while remaining fundamentally unchanged for more than half a century. “As I started to read it, it gave me an incredibly warm feeling,” says Feltham. At the heart of the booklet is a tour of the then-brand-new, purpose-built campus. The text makes no effort to hide the polytechnic’s pride. Ladies Dressmaking and Tailoring is included as its own 150-hour program. “Beauty Culture” gets a paragraph, which locates its laboratory across the hall from the barber shop classroom. 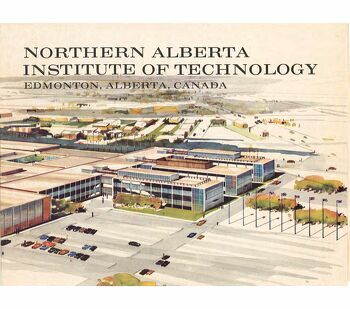 The booklet features several other quaintly antiquated examples of the latest and greatest of a newborn NAIT (that said, more than three-quarters of its 43 disciplines are still offered in some form today). But, for Feltham, each serves to highlight how NAIT was a leader in serving the province from its start. While that role continues to evolve, Feltham sees the booklet as an anchor, rooting the polytechnic in the purpose it was created to fulfill. It arrived buried in a box, but it now has pride of place among NAIT’s defining documents – and among the president’s own collection of workplace treasures. “I’m not letting this leave my office,” he says.